Perhaps there is nothing more difficult to write than a message in a sympathy card. Knowing someone who is going through loss can be difficult, and figuring out what to say to that person can be confusing. A few options include writing something encouraging, meaningful, or supportive. Make your message sincere and thoughtful. Use the following examples to help you figure out the best words to write. Life continues in good memories, and friends provide comfort when needed. Don't hesitate to reach out to me, your good friend. Anyone who has lost someone close in the past knows that a piece of those who were lost lives on in the hearts of the living. I can't think of anything I can say that will make everything better. I do want you to know that I love you and that I am available to talk. I know that I can’t fix the pain you feel. I want you to know I feel for you, I’m thinking of you, and I’d do anything to help you. I could not possibly understand everything that you are feeling. I want to convey to you my deepest sympathy anyway. I'm willing to listen. I know that even though you have a loss, you still have some great memories. I hope those memories will give you comfort. I struggle for the correct words to support you in the right way. Please accept my condolences despite my lack of eloquent expression. There’s nothing I know to say to help you in your time of sorrow. I know that you’ll always carry ___________ in your heart. I wish I could express to you all the appropriate words. All I can say is that I am sorry for your loss and that I want you to know that you mean a great deal to me. Please accept my condolences to you during this difficult time. I want you to know that you’re in my prayers. I know there’s nothing I can say or do to fix things. Please know that you are in my thoughts and prayers. I wish I could do more than give you my sympathy. Please let me know how I can help. Know that I am here if you need anything, and I love you. We will miss ___. He/she was a wonderful person. We are praying for you and your family, and we're sending our love your way. 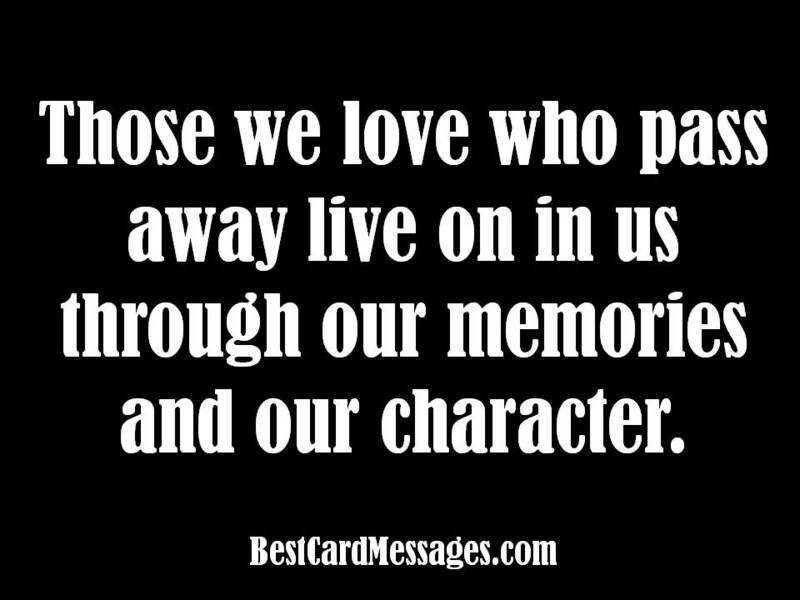 Those we love who pass away live on in us through our memories and our character. I am sorry about your loss. You will be on my mind. I don’t know what you’ll need in the coming days, but I’ll be checking in on you. The pain of loss is something that none can escape, but you don’t have to go through it alone. I'm available anytime. It's difficult to lose someone close. If there is any way I can make things easier for you please let me know. Expect me to call to check on you in the next week. I am praying for you to get through this time with the peace that comes from the knowledge that God loves you and that He will take care of you. I am sending you this card to let you know that I am thinking of you. I am sorry for your loss. I was saddened to hear of your loss, and I realize you have lost a blessing from God. I pray that God will bless continue to bless you in other ways and strengthen you. I am at a loss for words, and I don't know what to say to you to help you feel better. Please accept my condolences anyway. I'll be praying for you. I hope that you know that you can call me anytime about anything. Let me know what I can do to help. I hope you understand that when people write on a card, 'Sorry for your loss,' it is only because they can't put together words to describe what they are wanting to express to you during this time. With that said, I am sorry for your loss. I am sorry you lost your dad. I haven't written a sympathy card message before, so I don't know exactly what to say. You and your family are in my thoughts and prayers. The sting of pain will lesson over time. That's how the grief process works. Please remember that you don't have to grieve alone. Some people are so special they become part of you. In that way they live on forever. One of the best things about having friends is knowing you'll never have to bear a loss alone. I will be bear that weight with you. If you need anything that I can help you with I will. For anything beyond my control, I'll ask someone who can help by praying for you. Love transcends death. Death has no power over love. Jesus proved that. If there were no afterlife there would be no hope for any of us. Hope is the most important thing we can hold onto in life and death. Praise the Lord for his salvation and defeat of death. "Whosoever believes in Him shall not perish but have everlasting life." I will pray for your family during this difficult time. I will ask God to give you comfort, strength, and peace. I admired _________ for his strength of character and his faith. I will continue to be inspired by the actions he took and the things he said while he was alive. He will live in my memories. I believe that ___ is enjoying being home with Jesus. He will be missed for now, but we will see him soon. Though the body dies, the soul lives one. ____ is a beautiful soul. Our Lord is mightier than anything we may face. He will comfort those who mourn, and we will all celebrate with him eventually. Don't try to tell the person how he/she feels. For example, "I know you probably feel awful and mad at the world." It's best to assume that you don't know how the person feels. Don't write anything about your own problems. If you lost someone once, you can mention something that helped you. Question the purpose of bringing up your own experiences in the sympathy message. Save stories for when you talk to the person. Don't ever bring up a debt or something that was borrowed of yours. If someone borrowed something or owes you money, be decent enough to wait a few weeks before asking for it from the family. Unless, of course, you think they are going to sell it or claim it as their own. Even then, consider thinking of the money or borrowed item as a sympathy gift. Don't include judgments from God such as, "It was his time to go, it's all for the best, or he lived a good life and he's in heaven." You won't know what is going through the surviving person's mind, and you are not God. Always stay positive. An untactful sympathy card message that is positive is better than a negative message that is eloquently written. When in doubt, make your message shorter, not longer. The more you write, the more chance you have to offend someone. Brief is good. Stay to the point. If you offer to help someone, knowing they will have a difficult time, tell the person how you want to help. This prevents the person from asking you to do something you don' t actually want to do. Also, the likelihood that the person will actually call you for help is low, so tell when you will call them. If you want to write your own message, you can use these common words found in good sympathy messages. Combine these after thinking about how each could fit into your message. "Please accept my condolences for your loss. I will pray that you have strength and peace in this moment of grieving." "George owed me 25 dollars." As ridiculous as it sounds, some people think it's o.k. to bring up that the deceased owes money. Those same people might spend more on a sympathy gift than the money owed. Don't use a sympathy card to mention that someone owed you money. "It was Ruth's Time." This is just stating the obvious. She's dead, so it was her time. You don't need to point out the obvious. "At least Jim's pain is over." This is a message that doesn't help comfort the person who is grieving. He or she may be feeling an extreme loss. Maybe the surviving person would rather the deceased be in pain and alive with them. How can you be sure someone's pain is over anyway? "In a year from now, you will be over all of this and move on with your life." Sure this sounds like a great way to get the person to rationalize feelings, but it's not likely to comfort someone in a time of grief. Meet the grieving person in the moment, then help them find that peaceful future. "Your husband deserved to die. You are better without him." Maybe he was an angry man, or he may have had a drinking problem or something. Making a judgment about whether someone is better off dead is not appropriate for a sympathy card. You might as well buy a congratulations card and celebrate not having to be around the deceased anymore. Even though these examples seem ridiculous, some people will not have the sense to leave these out of a sympathy card. Some people will do other things such as make the message focus more on themselves than the person grieving or the person who died. And they will believe that they are helping. It's possible this is one time when it is the "thought that counts." Try to make your message count, not just the thought.